Are there restaurants you’ve been wanting to try, but haven’t because of cost? 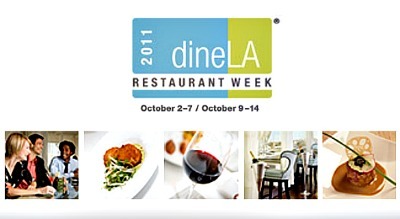 Now’s the time because DineLA Restaurant Week is back for its bi-annual two week run — October 2-7 and 9-14. This is an opportunity to indulge in a selection of three-course prix fixe meals for lunch and/or dinner at a special price. And it’s the perfect opportunity to get out of your neighborhood and go somewhere new. Dine at great restaurants for less. Over 300 restaurants will be featured in one of three dining categories with — deluxe ($) dining (lunch $16, dinner $26); Premier ($$) Dining (lunch $22, dinner $34); and Fine ($$$) Dining (lunch $28, dinner $44). Prices and meals vary by restaurant and exclude beverages tax and gratuity. This season, dineLA Restaurant Week welcomes newcomers Picca, Chef Ricardo Zarate’s much talked about new Peruvian eatery; Mediterranean-inspired East-Coast transplants Fig & Olive on Melrose Place and Mr. C Beverly Hills, Scarpetta at the Montage Beverly Hills and Lukshon in Culver City. Returning hot spot restaurants also NOT in in the 818 include The Foundry, BOA, The Bazaar by Jose Andres, Bouchon, Nobu, Street, First and Hope, BLT, Maison Akira, Street, Lucques, and Comme Ca, plus lots more. Click here to get the entire list. Interesting to note that of the around 300 restaurants, only 18 are in the Valley. Looks like the sponsors really did not chase Valley restaurants very hard.